What is Crowdfunding? Clear, Simple Answer Here. Guides > Crowdfunding Guide > What is Crowdfunding? Crowdfunding is essentially the opposite of the mainstream approach to business finance. Traditionally, if you want to raise capital to start a business or launch a new product, you would need to pack up your business plan, market research, and prototypes, and then shop your idea around to a limited pool or wealthy individuals or institutions. These funding sources included banks, angel investors, and venture capital firms, really limiting your options to a few key players. You can think of this fundraising approach as a funnel, with you and your pitch at the wide end and your audience of investors at the closed end. Fail to point that funnel at the right investor or firm at the right time, and that’s your time and money lost. Crowdfunding platforms, on the other hand, turns that funnel on-end. By giving you, the entrepreneur, a single platform to build, showcase, and share your pitch resources, this approach dramatically streamlines the traditional model. Traditionally, you’d spend months sifting through your personal network, vetting potential investors, and spending your own time and money to get in front of them. With crowdfunding, it’s much easier for you to get your opportunity in front of more interested parties and give them more ways to help grow your business, from investing thousands in exchange for equity to contributing $20 in exchange for a first-run product or other reward. Reach – By using a crowdfunding platform like Fundable, you have access to thousands of accredited investors who can see, interact with, and share your fundraising campaign. Presentation – By creating a crowdfunding campaign, you go through the invaluable process of looking at your business from the top level—its history, traction, offerings, addressable market, value proposition, and more—and boiling it down into a polished, easily digestible package. PR & Marketing – From launch to close, you can share and promote your campaign through social media, email newsletters, and other online marketing tactics. As you and other media outlets cover the progress of your fundraise, you can double down by steering traffic to your website and other company resources. Validation of Concept – Presenting your concept or business to the masses affords an excellent opportunity to validate and refine your offering. As potential investors begin to express interest and ask questions, you’ll quickly see if there’s something missing that would make them more likely to buy in. Efficiency – One of the best things about online crowdfunding is its ability to centralize and streamline your fundraising efforts. By building a single, comprehensive profile to which you can funnel all your prospects and potential investors, you eliminate the need to pursue each of them individually. So instead of duplicating efforts by printing documents, compiling binders, and manually updating each one when there’s an update, you can present everything online in a much more accessible format, leaving you with more time to run your business instead of fundraising. Just like there are many different kinds of capital round raises for businesses in all stages of growth, there are a variety of crowdfunding types. 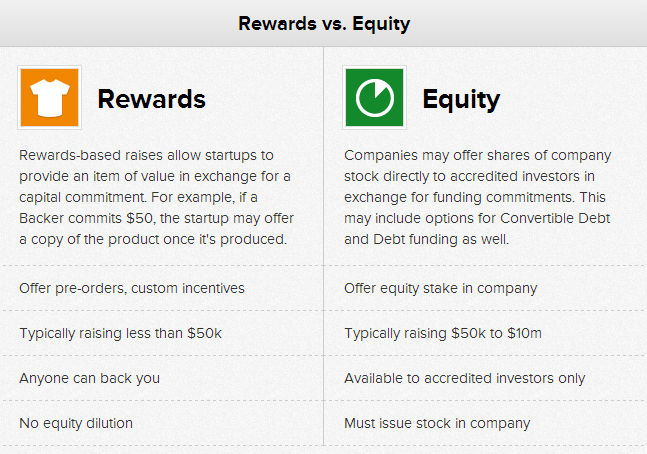 Which crowdfunding method you select depends on the type of product or service you offer and your goals for growth. The 3 primary types are donation-based, rewards-based, and equity crowdfunding (this guide will focus mostly on rewards-based and equity). Broadly speaking, you can think of any crowdfunding campaign in which there is no financial return to the investors or contributors as donation-based crowdfunding. Common donation-based crowdfunding initiatives include fundraising for disaster relief, charities, nonprofits, and medical bills. Rewards-based crowdfunding involves individuals contributing to your business in exchange for a “reward,” typically a form of the product or service your company offers. Even though this method offers backers a reward, it’s still generally considered a subset of donation-based crowdfunding since there is no financial or equity return. This approach is a popular option here on Fundable, as well other popular crowdfunding platforms like Kickstarter and Indiegogo, because it lets business-owners incentivize their contributor without incurring much extra expense or selling ownership stake. Read more about preparing and launching a successful rewards-based campaign here. Unlike the donation-based and rewards-based methods, equity-based crowdfunding allows contributors to become part-owners of your company by trading capital for equity shares. As equity owners, your contributors receive a financial return on their investment and ultimately receive a share of the profits in the form of a dividend or distribution. Read more about preparing and launching a successful equity-based campaign here. Crowdfunding – A method of raising capital through the collective effort of friends, family, customers, and individual investors. Accredited investor – An individual whose net worth is greater than $1MM, or whose income exceeds $200k for the past 2 years. Currently the U.S. Securities & Exchange Commission (SEC) mandates that only accredited investors are legally able to invest in private companies. Donation-based crowdfunding – Any crowdfunding campaign in which there is no financial return to the investors or contributors. Rewards-based crowdfunding – Any crowdfunding campaign that involves individuals contributing to your business in exchange for a “reward,” typically a form of the product or service your company offers. Equity-based crowdfunding – Any crowdfunding campaign that allows contributors to become part-owners of your company by trading capital for equity shares. Following, ‘What is Crowdfunding?’, we’ll take a look at the roots of crowdfunding, dating as far back as the 1700s, and some of the ways the new technology and legislation is transforming the industry.